DISCUSS THE CLAIM THAT YOUNG PEOPLE ARE BECOMING DESENTISED TO VIOLENCE In the aftermath of the child-killing tragedies involving the Jamie Bulger case, and the Columbine massacre, anxious parents and authorities looked for an easy scapegoat. It became clear in both cases that there were similar circumstances, namely that in both the killers had viewed violent films and video games, and therefore a na�ve assumption was created whereby the killers had merely copied what they had seen to be acceptable. 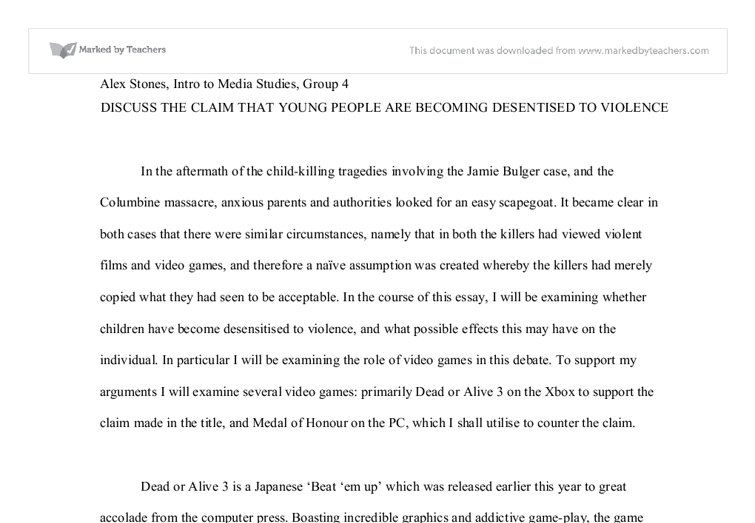 In the course of this essay, I will be examining whether children have become desensitised to violence, and what possible effects this may have on the individual. In particular I will be examining the role of video games in this debate. To support my arguments I will examine several video games: primarily Dead or Alive 3 on the Xbox to support the claim made in the title, and Medal of Honour on the PC, which I shall utilise to counter the claim. Dead or Alive 3 is a Japanese 'Beat 'em up' which was released earlier this year to great accolade from the computer press. Boasting incredible graphics and addictive game-play, the game successfully reached the homes of one million people, a huge milestone for a video game. ...read more. Harris and Klebold enjoyed playing Doom, a classic, gory 'shoot 'em up' from the mid-nineties, which was also used by the US military to make their soldiers more efficient killers. On Harris's website they found a modified version of Doom, in which there were now two shooters (as opposed to the original one), each with extra weapons and unlimited ammunition, and the other people within the game are unable to fight back. Video games gave the youngsters an opportunity to practice their massacre, before they launched it upon the real world. It seems entirely plausible that without this game, the two boys may never have dreamt up such an awful atrocity. The film Bowling for Columbine by Michael Moore brought up an interesting number of points regarding the influences on the two boys. First, while the boys did play violent video games, they also occupied themselves with many other activities. On the morning of the killings, the boys went bowling for two hours. So why do people not turn their blame to bowling? Or perhaps books? Films? Music? Secondly, apparently 90% of children in Britain count themselves as regular video game users. Common sense will tell us that that this percentage does not equate into violent crime committed by children. ...read more. It would be ignorant to view all violent video games as disruptive and harmful to a child's life. The game Medal of Honour is a 1st person shooter set in WWII, from the standpoint of the allies. The action is very graphic as you shoot numerous Nazis, but behind the violence the game very carefully educates the gamer on the history of the war, as well as warning future generations the perils of evil within the world that led to the outbreak of the war originally. From a personal standpoint, I find it extremely disappointing that there are some who link crime and violence involving children, with the content of the material which they have seen. When I was six I saw Aliens, a violent sci-fi film which carried an 18 certificate. In retrospect, I suppose that I had become, in a sense, desensitised to a small extent towards violence as I had never seen anything like it before. But I did not feel the temptation to commit and act of violence. From a broader point of view, we live in an ever changing world where violence and aggression is accepted as the norm. Has there ever been a more apt moment to give children an indication of what really lies ahead for them? 1 Barrie Gunther, The Effects of Video Games on Children, Sheffield Academic Press, p50 2 www.apa.org Alex Stones, Intro to Media Studies, Group 4 ...read more. This student written piece of work is one of many that can be found in our University Degree Electronic Media Studies section. What are the effects of violent video games on society? Playing the kill-or-be-killed games can improve your ability to see objects at dusk, peripheral vision, and the games can even be used to treat amblyopia or lazy eye (Matthews). Another possible advantage is when you play an action video game; you learn to better allocate your resources. 'We are all cyborgs now.' Discuss with regard to sexual identity and practise. Protecting the vulnerabilities of the body with technology is an age-old quest and man has always endeavoured to be invincible to his enemies and gain a rather unfair advantage. Does this wish to protect bodies with technology explain our scientific advancements so far or are we cyborgs already? Other research has shown that when children are exposed to scenarios in which violence is punished, they are less likely to engage in violent behaviors, Dr. Kieffer added. (Moyer) Playing violent video games causes the development of aggressive behavioral scripts. Table 1 Webshots considers its free download service as an excellent marketing tool as most people came to know Webshots when they are attracted by the high quality wallpapers and screensavers. Service of photo printing and other merchandises is another source of its revenue. to be broadcast.� And, perhaps best of all, how it will have no bounds: �Content will no longer be limited to 3 networks or 36 cable channels, but rather by production economics.�� (Real 127) Prospects like this is the way that television is going to end up in the next ten to twenty years. Since its establishment in 1973, the organization has certified more than 40,000 professionals in the U.S. and other countries. Candidates for the Institute's certification exams must subscribe to its Code of Ethics. ICCP'S ethical code consists of two parts: the Code of Conduct, and the Code of Good Practice. Teenage attitude towards negative effects of playing video games. 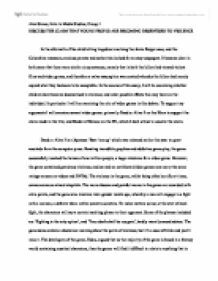 Furthermore, this research is aimed to present a objective view of how teenagers (game players and non-game players) think of the topic of negative effect of playing video games. Consequently, our knowledge covering this topic will be increasingly comprehensive. Method The research was based on a small questionnaire constituting 8 questions.